Scale changes the size of the selection in equal amounts vertically and horizontally. Stretch changes the size of the selection in differing amounts vertically and horizontally. Slant stretches the shape while also skewing the shape in horizontal or vertical directions. Distort changes the size of the selection in differing amounts in all four directions. To establish the counts where the resizing transition is toe begin and end in the drill, set the Red Anchor on the Count Track to the count where the resizing is to end. This is typically the count of the set you are currently working on. Set the Yellow Anchor to the count where the resizing is to begin. This is typically the previous set. After selecting the shape or shapes that you want to resize, clicking on the Resize tool will display the Resize Tool Control Panel. The selected performers are bordered on all sides by a Resizing Box. The Resizing Box has editing handles at all four corners that can be moved. Dragging the editing handles will manipulate the shape in a behavior based on the resize model chosen: Scale, Stretch, Slant, Distort. While dragging the editing handles the location of the cursor is displayed in the Console as well as the Largest Stride and Largest Distance. Bridge lines are drawn from the original shape to the new resized shape. These lines represent the paths taken by the performers. The bridge line drawn in red is the performer taking the largest stride. Entering a value in the Scale To box will uniformly scale the selection by the amount entered. Changing the value in the Interval box will resize the shape to the interval specified. 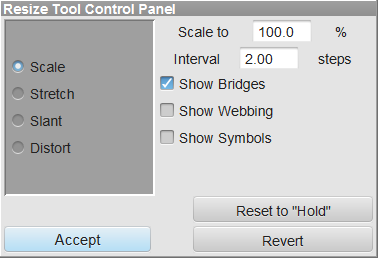 Show Webbing displays graphically the resizing formula used on the selected group. This is rarely used, however, can be useful with the Distort mode to understand how the handle movement is distorting the group. Revert button resets the handles to their initial position.